SHTFplan Editor’s Note: Nothing could be more terrifying than when agents of the government kick in your door to take your children, especially if you have done nothing wrong. But that’s exactly what school districts across the country are now telling parents is going to be done unless they comply with their requests. As you’ll see from the report below by Daisy Luther of The Organic Prepper, we have now crossed into a very dangerous time in America, and one in which snitches in all walks of life, including our childrens’ classrooms, are using the power of the state to force compliance, even with non-existent regulations. They don’t care about your ideals, your beliefs, or the morality of what they are doing. They simply want total control of every aspect of your life, even your kids. And if you don’t do what they say, they will send armed agents of a militarized government to do their bidding. Make no mistake. If you fail to comply, they won’t come knocking nicely. The reality is that you will have police cruisers and anti-terrorism teams at your doorstep. They’ll be fully armed and prepared to kill you if you fight back. And they WILL take your children should they decide they want them. We are living in a police state… that should now be crystal clear. 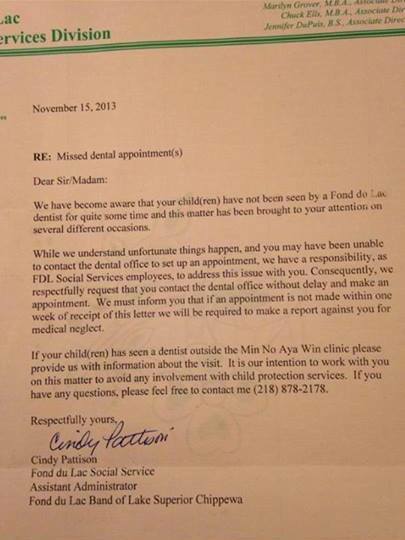 What would you do if you received a threatening letter from your child’s school, demanding that you take your youngster to a medical doctor and dentist at the whims of the school administrators, or risk being reported to the child welfare authorities? Under the auspices of keeping children healthy, the government has usurped the role of “parent” away from actual parents. The state — not legal guardians — is determining when and how children should be subjected to outside business influences. The provisions establish that the state has taken the final say in parenting matters, undermining parents’ natural role in the child’s life as protector and final decision maker. The provision invades the privacy of the family by giving the government access to private medical results. It is our intention to work with you in this matter to avoid any involvement with child protection services. This letter is threatening the parents of this youngster with child welfare agencies if they do not comply with the demands of the school. So, potentially, at the very least, the welfare agency could investigate the family, and at the worst, take steps to remove the child from the household, all because a parent might have different ideas about healthcare than those of the school system. This brings us to some very important questions about privacy and the right to make decisions for your own children. If you are anti-vaccine, will the doctor refuse to sign the letter? What happens then? What if the medical or dental visit is not in the budget at the time the school demands it? What if you choose to treat your child’s concerns with natural substances and diet, but the doctor wants you to medicate with pharmaceuticals? What gives the school the right to tell you that you must take your child to a standard physician instead of a holistic practitioner? What if you refuse to have your child’s teeth treated with toxic fluoride? Will your child be subjected to nosy questions, such as inquiries about firearms in the home? The US government seems more and more convinced that THEY own YOUR kids. Just this week, a Tennessee dad was arrested for picking up his young children after school instead of allowing them to cross into traffic as the school’s policy demanded. Some schools won’t allow lunches to be sent from home, and if they are, the school insists on supplementing those lunches at extortionistic rates in order to control the situation regardless of parental wishes. This doesn’t even take into account the dumbed down Common Core curriculum, the absurd attempts to be politically correct, and the zero-tolerance insanity that causes kids to be charged with felonies for having loaded fishing tackle boxes in their vehicles or cutlery in their lunch boxes. If you’re wondering why so many people homeschool, add this to the ever-growing list of reasons. This article was originally published at The Daily Sheeple.